Mediterranean Chicken and Rice Skillet is a one pan chicken dinner. 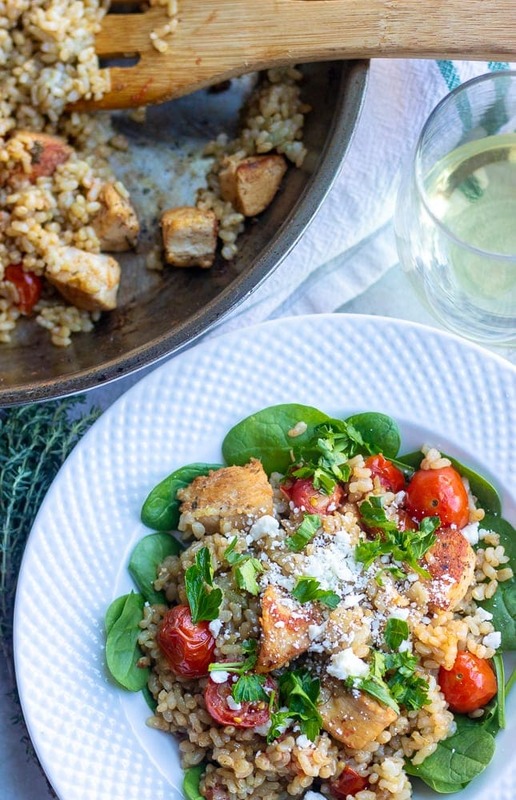 This chicken skillet dinner is brimming with flavor from garlic, white wine, fresh thyme, spinach, tomatoes, and feta cheese. Just like you, I am always in need of easy meals that not my family will eat and enjoy. This elevated chicken and rice skillet, fits the bill! 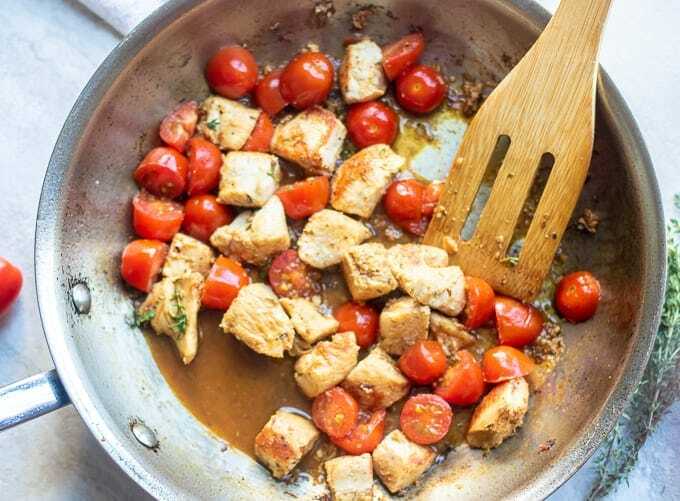 Mediterranean Chicken and Rice is a full meal made in one pan, full of incredible flavor, and is ready in less than 30 minutes. 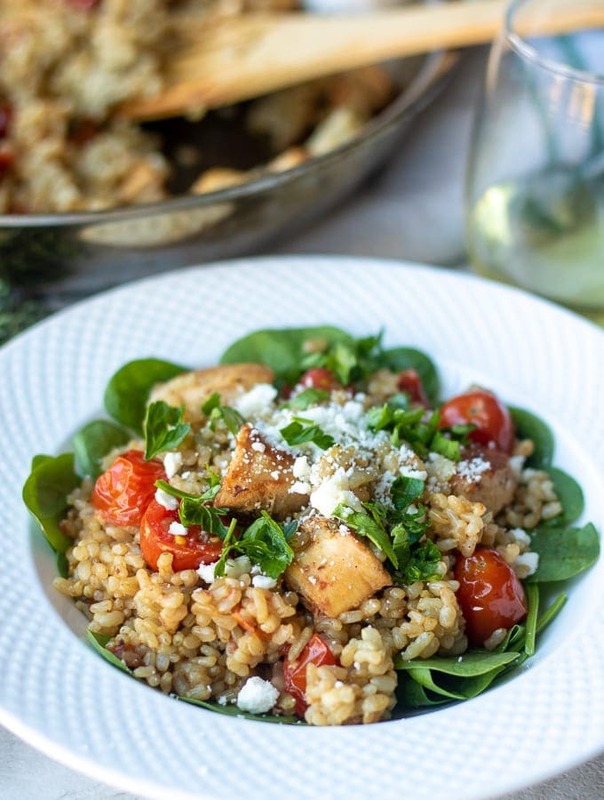 Simple chicken and rice becomes elevated with white wine, grape tomatoes, fresh thyme, and feta. This is one skillet meal that is truly restaurant quality and when paired with a nice bottle of wine, it becomes a stand-out dinner worthy of company. 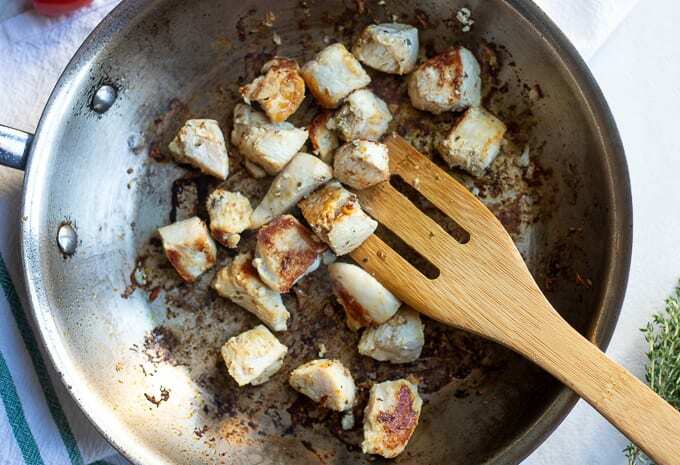 Cut boneless, skinless chicken breasts into 1 inch cubes. Season liberally with salt and pepper. Add in olive oil and heat. Add chicken to heated skillet and sear chicken on all sides, about 2 minutes per side. Add in wine (or stock) and scrape off any browned bits of on bottom of skillet. Add in garlic, thyme leaves, and tomatoes. To the skillet add in the stock and rice. Reduce heat to a low simmer. Simmer rice and chicken until rice is tender, about 10 minutes. Turn off heat and let sit for 5 minutes. Remove thyme leaves from skillet. Serve chicken and rice over a bed or spinach. Top with crumbled feta cheese and an additional drizzle of olive oil. Feel free to substitute white rice for brown rice, just be sure to use a quick-cooking rice for this meal to be ready in less than 30 minutes. Boneless, skinless chicken thighs work as well as chicken breasts. If you do not drink/cook with alcohol, just use additional stock. For the best flavor, use fresh thyme leaves, but 1/2 teaspoon dried thyme will work in a pinch. 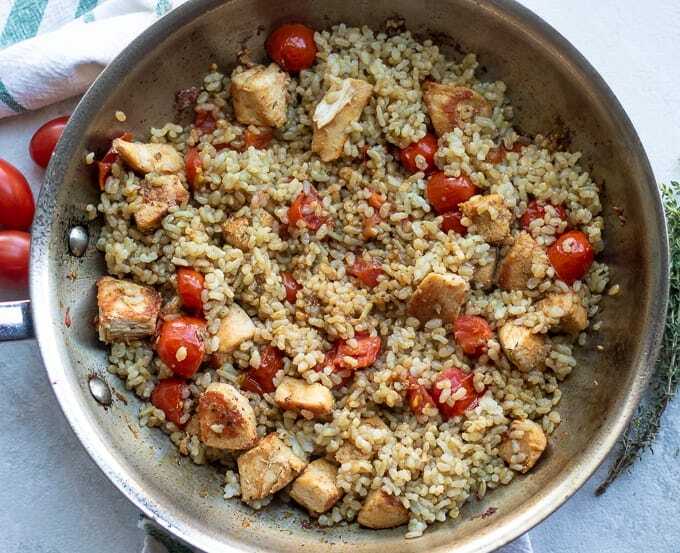 An easy one skillet recipe for chicken and rice filled with Mediterranean flavors. Heat the oil in large skillet that has lid over medium-high heat. Season the chicken with salt and pepper and brown chicken on both sides, about 2 minutes per side. Deglaze pan with white wine, stirring up all the browned bits on the bottom of the pan. Add in garlic and tomatoes, saute for 1 minute. Add in chicken stock, thyme, tomatoes, and brown rice to pan. Bring to a boil ,cover, and reduce heat to a low simmer. Simmer for 10 minutes. To serve chicken and rice, spread spinach out in a large serving bowl or platter and top with rice and chicken mixture. Sprinkle with feta and an additional drizzle of olive oil. Thank you so much! It is such a quick and easy meal to pull off! This looks simple, hearty and flavorful! Great idea! That is a perfect way to describe this! Wow, 25 minutes?! I need to get some Minute Rice! My family would devour this! Hearty, healthy and flavorful – the perfect combination! Thanks for sharing, Kristen! Thank you Allison!! This is quite a pleasing meal! This looks SO delicious Kristen!! I need all the help I can get for quick meals over the holidays! I love all these delicious flavors! And an easy dinner recipe is perfect this time of year! Thank you Liz–busy time of year, definetly needs easy!! Arugula and tomatoes do add so much! This is such a beautiful dish! Aw, thank you! The more important thing is that it is tasty too! Thanks Karen! I love those serving spoons myself! This is my kind of dinner! I love chicken any day of the week! This is perfect for a last minute meal! As if I needed another reason to come back to NC! Wish I could run over and enjoy some of this with you right now!! (Maybe someday … Lord willing!) <3 Love the fresh thyme and that rice looks divine. Five stars! I wish you could too sweet friend. Praying for one day! This looks so absolutely delicious! I love the veggie and veto combo. I’m a little late to the party here, but I’ve started using your recipes to make my grocery lists! So delicious and I’m all about fast, easy to clean up week night dinners!! YAY!!! I am so glad you are using my recipes to help make dinner easy! And so glad you are enjoying them. Thanks so much! This is an absolutely amazing recipe! Its looks delicious and it is super healthy for my family and I!! It really is healthy and delicious! This looks like just the kind of chicken and rice meal I love for the hectic work week. Usually I’m thinking about what to fix for dinner around 5 o’clock so something like this dish would sure come in handy. Love the hint of thyme you added to the mix too. What do you think of using cauliflower rice in this instead of the brown or white? It’s looks fantastic! Thank you! I think that is a great idea to keep this low Carb! I love using cauliflower rice myself, just cook the chicken and tomatoes in the wine and seasonings. Then add in the cauliflower rice. You shouldn’t need the extra chicken stock. Enjoy!